Nearly all types of plastics can be recycled, however the extent to which they are recycled depends upon technical, economic and logistic factors. As a valuable and finite resource, the optimum recovery route for most plastic items at the ‘end-of-life’ is to be recycled, preferably back into a product that can then be recycled again and again and so on. The UK uses over 5 million tonnes of plastic each year of which an estimated 29% is currently being recovered or recycled. This page aims to give an insight into the current market situation of plastics recycling in the UK and provides a snapshot of the different areas of activity with supporting information to illustrate the points raised. Wherever possible relevant links to other websites have been included so that the more interested reader can expand on the information given. Visit the plastic packaging recycling page to learn more about plastic packaging recycling. The UK has a plastic packaging recycling target of 57% by 2020. The BPF and Plastics Europe with the support of WRAP are implementing the Plastics Industry Recycing Action Plan (PIRAP) to help meet this target. 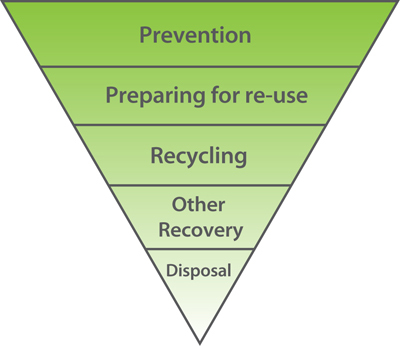 The recycling of plastics fits into the Waste Framework hierarchy of efficient and sustainable use of material resources often represented by the diagram below. The hierarchy is now enshrined in law as a result of the recently revised Waste Framework Directive. Using less material in design and manufacture. Keeping products for longer; re-use. Checking, cleaning, repairing, refurbishing, repair, whole items or spare parts. Turning waste into a new substance or product. Includes composting if it meets quality protocols. Including anaerobic digestion, incineration with energy recovery, gasification and pyrolysis which produce energy (fuels, heat and power) and materials from waste; some backfilling operations. Landfill and incineration without energy recovery. It can be seen that after considering any ‘re-use’ of a plastic product, (for example – multiple re-use of retail shopping bags), the owner of the plastic at the point it becomes ‘ready for disposal’ has a responsibility to ensure that the waste item is placed into a collection system which maximises the opportunity for collection and recycling of the material content. The vast majority of UK councils now offer householders some form of plastics recycling as part of the local authority waste collection system and this is generating increasing annual tonnages of post-consumer plastics packaging waste as the input raw material to the recycling sector. Across the construction, manufacturing and retail sectors the importance of capturing potentially valuable streams of waste plastics and channelling them into efficient recycling and recovery processing routes is now recognised as a key way to save costs and reduce environmental impacts of organisations. In the past few years the UK has seen rapid growth in the volumes of plastics collected and separated for recycling across both the public and private sector. These newly available tonnages of waste plastics present the industry with the challenge of how best to convert a waste resource into valuable new materials and products. In the last ten years the manufacturing industry has focused on minimising production waste and being resource efficient. As a result of this, the industry has seen a great decrease in the tonnage of plastic waste created as off-cuts or surplus scrap. A growing number of large modern manufacturing sites now also operate onsite recycling facilities in order to capture any valuable materials which would otherwise be disposed of as waste. Of the 5 million tonnes of plastics used per year a staggering 2.4 million tonnes is packaging. According to the Waste Resource Action Programme (WRAP), 1.7 million tonnes comes from households and the rest from commercial and industrial companies. Items such as plastic bottles, pots, tubs, trays, films and plastic bags are the most common types of household plastic waste. The Commercial and Industrial packaging waste streams are largely made up of stretch-wrap films, which are often used to cover goods during shipping and returnable transit packaging such as pallets, crates and drums. 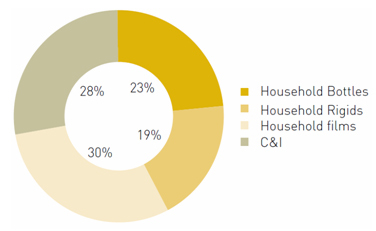 Post consumer waste arises primarily from UK households. The amount of plastic waste generated from the domestic waste stream has grown rapidly over the years placing a demand for more efficient and standardised approach to household waste collection by local councils. UK recyclers have stepped up to this challenge and in the last decade, there has been increased recycling activity across the industry. According to the RECOUP Household Survey 2015, 492,623 tonnes of plastic packaging was collected from households in 2014/15. 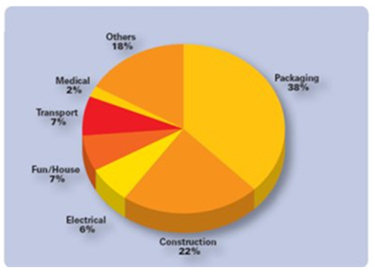 This represents an increase of 6.1% in rigid plastic packaging collected, 3.5% in plastic bottles and 12.1% of pots, tubs and trays. The recycling rate for plastic bottles is 57% and for pots, tubs and trays it is 30%. Innovations in plastic separation, sorting, washing and de-contamination technologies equipment have made it possible for mixed rigid packaging plastics to be efficiently collected and recycled. When it comes to recycling, plastics bottles have a good track record. 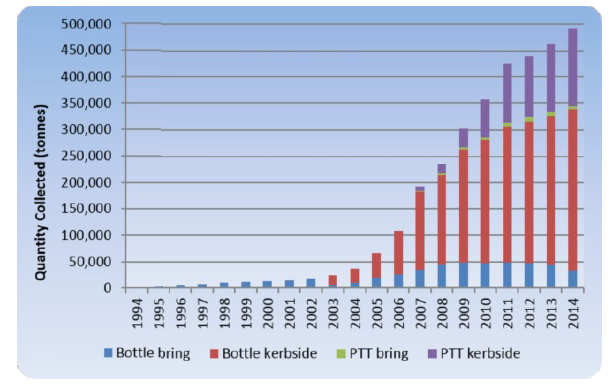 The recycling of drinks bottles including those for milk has grown rapidly over the years. PET and HDPE milk containers can now be recycled into food grade materials. This is a prime example of ‘Closed Loop’ recycling where the end use of plastics is carried out in the same place where the waste is collected. Recycling of post commercial and post industrial, commercial, post logistics and agricultural films is well established in the UK. It is estimated that over 1 million tonnes of plastic film from packaging arises in the UK waste stream with two thirds from households and one third from commerce, industry and agriculture (Source: BPF Recycling Group). There is also around 30,000 tonnes of UK non-packaging flexible plastic waste film arising from agriculture under the heading of Non Packaging Agricultural Plastics (NPAP). Around 20% of this non-packaging plastic film was estimated to be recycled in 2009. Typical products being made from recycled films products are refuge sacks, damp-proof membranes, fencing (garden, furniture etc). Whilst recycling of post-industrial, commercial, post logistics and agricultural films has been a success, the recycling of film from household waste still remains a challenge for the future. However, as demand for used plastic films continues to grow on the world trading market, there is greater pressure for UK recyclers to invest in new technology enabling the more mixed, printed and dirty films from household sources to recovered and recycled. For recent investigations by the Waste Resource Action Programme (WRAP) into the possibilities of recycling from post consumer kerbside collected packaging film click here to view the report. WEEE (Waste Electrical and Electronic Equipment) and ELV (End of Life Vehicles) represent three further areas where large tonnages of post-consumer plastics waste are beginning to be recycled. It is estimated that in the UK more than 2 million motor vehicles are sent to car recycling and car shredding plants every year. Approximately 70% of these are recovered as metals, steel, aluminium and copper. Traditionally the non-metallic components of ELV have been sent to landfill, this is now changing due to the EU ELV Directive which has set a strict target of 85% for the recycling and recovery of motor vehicles by 2015. Driven by these challenging targets, there has been large scale investment in sorting and recycling plants to recover the plastics and other materials from ASR (Automotive Shredder Residue). New plants have come on-stream in the past year which employ innovative sorting technologies to recover the plastics and other materials from within this very co-mingled, non-metallic waste from end-of-life vehicle processors. Every year 1.5 million tonnes of WEEE is disposed of in the UK. This rapidly growing waste stream is now controlled by the UK WEEE regulations which ensure that all separately collected WEEE is diverted to approved treatment plants to be separated and recycled. Several UK sites can recycle the mixed, rigid polymer used in modern electrical goods and there are many examples of closed-loop recycling chains being developed to get materials from WEEE back into new electrical goods. In all of the processes used to convert plastic raw materials into end products there is an inevitable arising of some scrap material. This results from the start-up and shutdown periods of the processing machinery, from out of specification products and from quality control samples. Almost all moulding companies recycle their own plastics waste in house. The specialist plastics recycling industry also recycles material of this type, mostly waste from thermoforming and off-specification mouldings. Some 250,000 -300,000 tonnes of plastics are dealt with in this way annually. Where the origin of the material is industrial waste, the recovered end-product is generally referred to as 'reprocessed' to distinguish it from 'recycled' material which is derived from post-use products. Degradability is another area of growing importance in waste-management terms. Degradable plastics including biodegradable plastics are commercially available and are used in the packaging for example of fruits and vegetables. Solutions to the litter problem will not be found in the increased use of one material such as degradable plastics, over another. The problem is caused by the behaviour of people and not plastics products. The impact of degradable materials on the recycling of conventional plastics is a topic for discussion between the recyclers and the manufacturers of degradable materials. Over recent years the levels of composting have increased dramatically and it is now seen as an important link with the waste-management chain. For more information on bio-based and degradable plastics, click here. HDPE high-density polyethylene Chemical drums, jerricans, carboys, toys, picnic ware, household and kitchenware, cable insulation, carrier bags, food wrapping material. PVC polyvinyl chloride Window frames, drainage pipe, water service pipe, medical devices, blood storage bags, cable and wire insulation, resilient flooring, roofing membranes, stationery, automotive interiors and seat coverings, fashion and footwear, packaging, cling film, credit cards, synthetic leather and other coated fabrics. LDPE low density polyethylene Squeeze bottles, toys, carrier bags, high frequency insulation, chemical tank linings, heavy duty sacks, general packaging, gas and water pipes. PP polypropylene Polypropylene can be processed by virtually all thermoplastic-processing methods. Most typically PP Products are manufactured by: Extrusion Blow Moulding, Injection Moulding, and General Purpose Extrusion. Expanded Polypropylene (EPP) may be moulded in a specialist process. PS polystyrene Toys and novelties, rigid packaging, refrigerator trays and boxes, cosmetic packs and costume jewellery, lighting diffusers, audio cassette and CD cases. Moulded plastics items should be marked in accordance with ISO 11469 where practicable. One industry led scheme to improve a particular waste sector is Recovinyl. Recovinyl provides financial incentives to support the collection of PVC waste from sectors not covered by the ELV Directive. This European scheme, backed by the British Plastics Federation, aims to ensure a steady supply of post-consumer PVC waste for recycling. Following the highly successful trial 'Recycle Your Vinyl Flooring’, flooring manufacturers Altro and Polyflor have launched a new vinyl flooring take-back scheme: Recofloor. Waste vinyl flooring collected under the scheme will be recycled and diverted from landfill. Axion Consulting has been appointed agent for the new scheme. Waste Framework Directive: This Directive provides the overarching legislative framework for the collection, transport, recovery and disposal of waste, and includes a common definition of waste and recycling. The Publicly Available Specification (PAS) 103 enables plastics waste to be classified according to its polymer type, its original use and any contaminants. Plastics recycling companies will be able to set purchasing specifications based on this PAS and collectors, sorters and traders of plastics waste will be able to maximise the value of their material by understanding the precise needs of the recycling industry. PAS 103 was sponsored by DTI, Biffaward, WRAP, EMR and Fujitsu Services. Recycled Plastic in Food Contact Applications: European Commission Regulation No (EC) 282/2008 on recycled materials and articles intended to come into contact with foods and amending Regulation (EC) No. 2023/2006 entered into force on 24th April 2008 and is directly applicable throughout the EU. The new regulation sets out the requirements for recycled plastics to be used in food contact materials and establishes an authorisation procedure of recycling processes used in the manufacture of recycled plastics for food contact use. It establishes requirements as regards the materials that can be recycled and the efficiency of recycling process to reduce contamination. The regulation aims to create a more efficient and practical system for regulating the use of recycled plastics in food packaging. Any company wishing to use recycled plastics in food contact applications will need to gain approval from the European Food Safety Agency (EFSA), which will base its safety assessment on factors such as the quality of the recycled raw material, the efficiency of the decontamination process and the plastic's intended use. Once EFSA has evaluated a particular case, its verdict will be forwarded to the EC. If the EC authorises the case, it will then be added to the register of approved recycling processes. Guidelines for applicants for the safety evaluation of recycled plastics to be used in contact with food have been published by EFSA, CLICK HERE for further information.